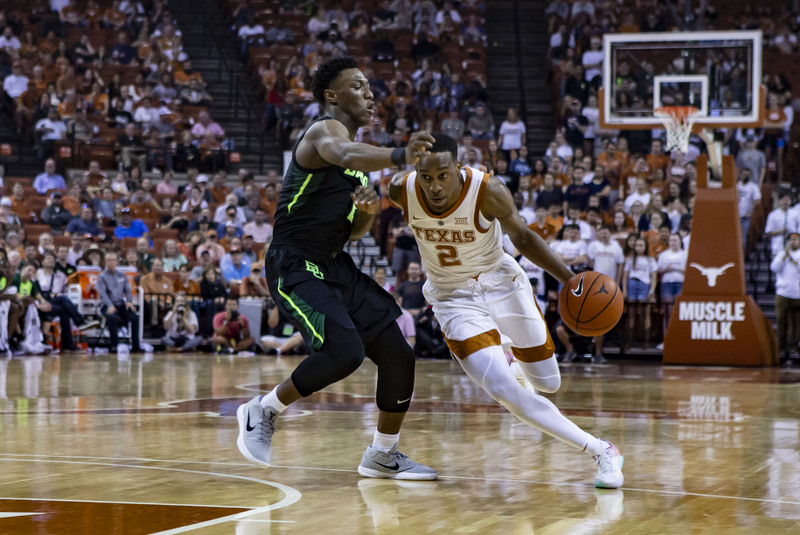 Guard Matt Coleman scored 18 points to help lead the Texas men's basketball team to a 84-72 win Wednesday over Baylor (photo by Horns Illustrated). AUSTIN, Texas — If fans are having a hard time figuring out which Texas team will show up from game to game, they are not alone. Anyone who has a notion about whether and when the Longhorns will come to play should contact Texas coach Shaka Smart forthwith — he would certainly be much obliged. The Longhorns have been nothing if not enigmatic this season, beating the likes of No. 7 North Carolina, No. 20 Oklahoma and No. 11 Kansas, but losing to Radford and Virginia Commonwealth, at home, and Oklahoma State in conference play. Then there was UT's emphatic 84-72 win Wednesday over Baylor in Big 12 Conference play at the Frank Erwin Center, a game in which the Longhorns put everything together for a full game for the first time in two months. Guard Kerwin Roach II scored 21 points on 7-of-9 shooting, and Matt Coleman III added 18 points, as Texas dominated a Baylor team that had won six straight games overall and six consecutive contests against the Longhorns. Just as UT's 73-63 Jan. 29 win over Kansas snapped a 10-game losing streak, the Longhorns’ effort against the Bears Wednesday surprised just about everyone ... and proved, again, that Texas can beat anyone. Geez, who knows what the Longhorns will do? “We played well for the majority of the game,” Texas head coach Shaka Smart said. “The key for us, and it has been all year, is recovering from something that doesn’t go well for us during the game, and we did a better job of that tonight. Jaxson Hayes added 12 points for Texas, and Courtney Ramey scored 10 for the Longhorns in the win. Texas led, 45-30, at halftime and pushed its advantage to 51-34 three minutes into the second half. Baylor answered with an 11-2 run to claw back to within eight points, at 53-45, with 15:25 to play. Jase Febres then canned back-to-back three-pointers to allow Texas (13-10 overall, 5-5 in Big 12 play) to pull back in front by 14 points. The Bears never got closer than nine points the rest of the way. The win was just the Longhorns’ second in their past five games. Texas’ five conference losses this season have come by a total of 20 points, an average of just four points per game. Texas is 3-4 this year in games decided by three or fewer points, and is 4-8 in contests decided by six points or fewer. “It was a 40-minute game, and we’ve been concentrating on putting a whole game together and we did,” Roach said. “We are aware of the conference standings and we understand how good Baylor is. We had to play our best, with some recklessness and confidence. There’s no doubt that the Longhorns have been up and down, but Texas brought its “A” game Wednesday. Mark Vital led the Bears (15-7 overall and 6-3 in Big 12 play) with 14 points, while Jared Butler scored 13, and Mario Kegler and Matthew Meyer added 10 points each. Makai Mason, who scored 40 points in the Bears’ previous game, a 90-64 blowout of TCU last Saturday, had only five points on 1-of-7 shooting from the floor. Next up for Texas is a trip to face reeling West Virginia, which beat the Longhorns by 30 points last year in to Morgantown. Nothing is easy in the Big 12, so don’t expect the Mountaineers to give anything but maximum effort.